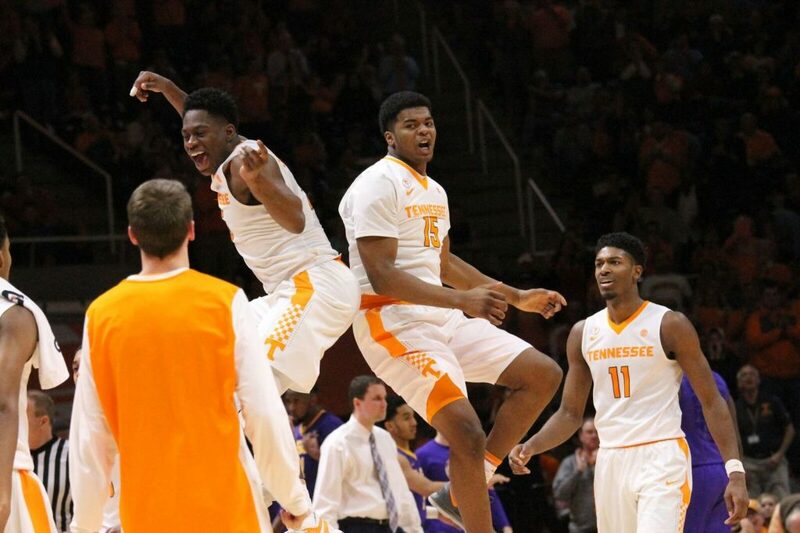 The hype around Tennessee’s men’s basketball team has never been higher. The Vols were voted as the No. 6 team in college basketball according to the preseason AP Poll voters, and that’s the highest preseason ranking in school history. Grant Williams and Admiral Schofield have been added to multiple watch lists for awards, and several analysts have picked the Vols as a darkhorse team to make it to the Final Four. But the hype isn’t stopping there. On the day Tennessee opens up their 2018-19 season, they’ve been picked by a couple national analysts to win the national championship at the end of this season. ESPN put out their yearly Final Four and National Championship predictions before the start of the 2018-19 college basketball season on Tuesday. They polled 31 of their analysts and experts, and all 31 shared their Final Four picks and who they think will be crowned the champion of college basketball when the season comes to an end. Of the 31 analysts they polled, 11 of them picked Tennessee to make it to the Final Four this year. And of those 11, two predicted the Vols as the eventual national champions this season. Tom Hart and Chris Spatola were the two analysts with the bold prediction that Tennessee would wind up the winner of the national championship this year. Tennessee’s main rival, Kentucky, was picked to win the national title by 10 of the analysts. Kansas was picked as the national champion by five analysts, and Gonzaga also received five predictions to end up as national champions. Virginia received four predictions, and both Duke and North Carolina tied with the Vols with two predictions to win the national title. Syracuse was picked once. The Vols have never won the national championship in men’s basketball. They’ve never even made it to the Final Four as a program. The closest Tennessee has gotten to the Final Four was in 2010 when the Vols came up painstakingly short against Michigan State in the Elite Eight. Six-seeded Tennessee lost 70-69 to No. 5 seed Michigan State in the Elite Eight that year, and that’s been the only time UT has made it to the Elite Eight in program history. Tennessee’s women’s basketball team has won multiple national championships. The Lady Vols have won eight total national titles in women’s basketball, and they’ve made it to the Final Four 18 different times. The men’s team has never made it to the Final Four once. But that’s not stopping national analysts from jumping on the Big Orange bandwagon for this upcoming season. Tennessee returns all five starters and all six of their leading scorers from last year’s team that went 26-9 overall, won a share of the SEC regular season title, and earned a No. 3 seed in the NCAA Tournament. All that returning experience, along with the veteran leadership of head coach Rick Barnes, is why the Vols are getting so much attention this year. The Vols will begin their 2018-19 season tonight at 7:00 PM Eastern when they host head coach Rick Barnes’ alma mater, Lenoir-Rhyne, in Thompson-Boling Arena.